Scientists raised an alarm and ozone-depleting chemicals were phased out worldwide. 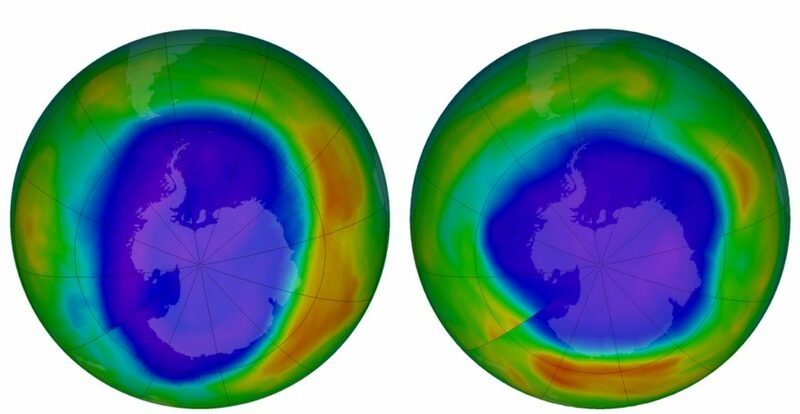 WASHINGTON — Earth’s protective ozone layer is finally healing from damage caused by aerosol sprays and coolants, a new United Nations report says. At its worst in the late 1990s, about 10 percent of the upper ozone layer was depleted, Newman said. Since 2000, it has increased by about 1 to 3 percent per decade, the report said. This year, the ozone hole over the South Pole peaked at nearly 9.6 million square miles. That’s about 16 percent smaller than the biggest hole recorded – 11.4 million square miles in 2006. The ozone layer starts at about 6 miles above Earth and stretches for nearly 25 miles; ozone is a colorless combination of three oxygen atoms. But it’s not a complete success story yet, said University of Colorado’s Brian Toon, who wasn’t part of the report. “We are only at a point where recovery may have started,” Toon said, pointing to some ozone measurements that haven’t increased yet. On its own, the ozone hole has slightly shielded Antarctica from the much larger effects of global warming – it has heated up but not as much as it likely would without ozone depletion, said Ross Salawitch, a University of Maryland atmospheric scientist who co-authored the report. Scientists don’t know how much a healed ozone hole will further warm Antarctica.